On March 26 the Colorado Springs Socialists (CSS) held a “March Against Imperialism”. About 15 people participated in this small demonstration meant to denounce militarism overseas. Six members of the group were arrested for jaywalking while marching. A court case revealed that two cops infiltrated the Colorado Springs Socialists. The case reminds us that all anti-fascist and anti-capitalist groups and projects always have to be aware that they can be infiltrated by cops and secret services. 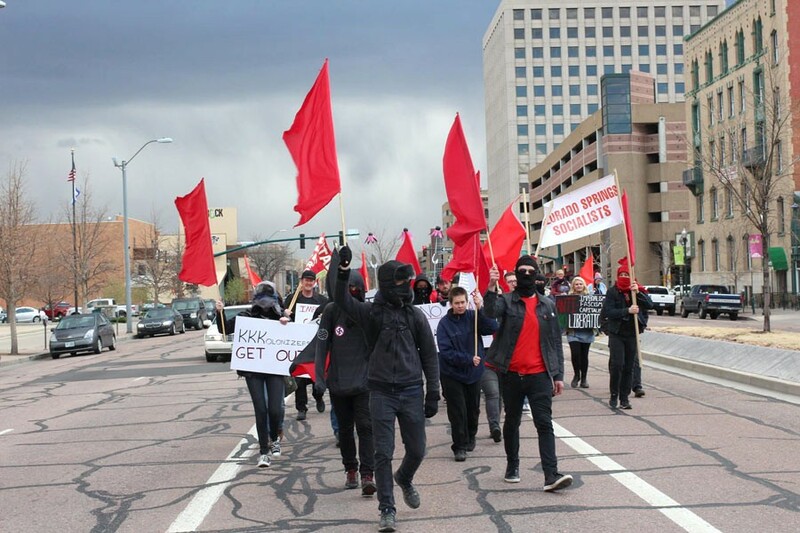 Image: Colorado Spring Socialists marching earlier this year. Image by Colorado Spring Socialists. Two Socialists took plea deals; the other four took their cases to trial in municipal court. They currently have an attorney representing them, but they were defending themselves (pro se) during most of the process; they requested the evidence collected by police for their defense (discovery). Included in the discovery packets were several videos, including four body cam videos from the police. After watching two of the videos – from Officers Krueger and Canaan – the Socialists were shocked; the videos clearly showed the fake arrest of a Colorado Springs Police Department or El Paso County Sheriff’s Office undercover officer. This UC had effectively infiltrated the Colorado Springs Socialists. Luckily, long before these videos were available to them, several CSS members became suspicious of the behavior of both UCs, Mark Jackson and Aimee, and they were ejected from the group. Most notably: Mark and Aimee only showed up for actions in which there was the potential for violence, e.g., counter-protesting at a Trump rally. This video (above) is edited only for time. The full videos are below. Mutual aid: On September 14 Cars of Hope Wuppertal will arrive in Greece to support refugees who are trapped in the EU member state, some for more than a year now. Cars of Hope will be active in Athens and on Lesvos. A few members of the Enough is Enough collective will join them. They will work together with refugees and distribute food, sanitary products and other basis needs. Our work with refugees is only possible because of the many donations we receive. Read more about the support work with refugees in Greece by Cars of Hope; here and in this interview.